Every social media platform was making the changes according to the latest trends and ways that people are following on the web. The Twitter platform is the busiest microblogging platform. It is always noisy with millions of Tweets, and even the celebrity usage is also very high on the Twitter platform. Twitter is the best platform to meet the massive audience in real time tweeting and use Twitter for Video Marketing. Twitter has made several changes to its platform with the introduction of the video content on its platform.It is also acquired the video streaming application named Periscope as there is an increasing demand for the videos on the web. 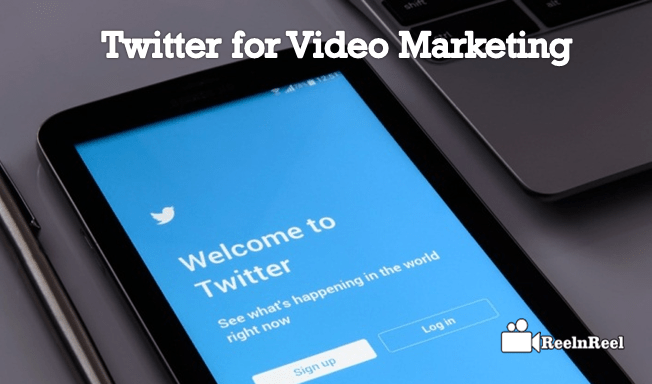 Twitter for Video Marketing allow the advertisers to upload their video directly to the Twitter platform by including different types of keywords that are relevant to their content. Twitter offers cost per view model type of ads for the advertisers. When it comes to the famous micro-blogging platform, Twitter had started the photo, video and link sharing options for its users. So, now the users can use the efficient way of sharing their photos and video clips on the platform. We include the media in our tweets to increase the followers and the retweet number. To share your favorite pictures on Twitter platform. At first, we have to click on to the camera icon in Tweet box which located in the left corner to it. Then you can select your image for uploading, and it appears in the Tweet. You can also link the videos on the Twitter platform within your Tweet as the platform had already get integrated with the Vimeo and Youtube platforms. So, you can share the videos and make your followers watch even on their smartphones. You can also share the vine videos within your tweets. You can personalize the photo gallery on Twitter. That means, what you have included in your tweets will be there in your gallery and your followers can look your snapshots or the scenes behind the screen etc. you can also share the links to the websites on Twitter.Though there is a character limit of 140, Twitter shortens your URL to that limit and there will no problem in sharing. Even you can apply various effects to your photos that uploaded to the Twitter. Twitter is the noisiest platform where some millions of Tweets are posted every minute on the platform. When comes to the native player on Twitter, It hosts the video length up to ten minutes, and these will not be any limit on the size of the file. The Twitter platform was earning one billion dollars annual revenue from the pre-roll ads on its platform. A twitter native video ads enhance the advertiser’s experience as the platform allows the advertisers to select their video view of campaign objective which based on the cost per view. Many advertisers had reached their goal with the native video ads on the Twitter platform. Here are some essential tips that can be helpful in optimising and promotion of Twitter native video. To capture the attention of the users and the video must be media forward and creative. It must display on the timeline. The video that uploaded natively can show the timetable but, the video which the link posted will not appear, and it just appeared as a link but not the video. So, while promoting you must optimise your video accordingly to attract the viewers to receive high conversions. Thumbnails play an essential role in the promotion of your native video. After the video upload, the platform allows you to choose your thumbnail for your video. You can test some thumbnails on your video and select the relevant and attractive thumbnail for your video which can attract the audience efficiently. The first few seconds is the most important because users interested in your video if your video attracted them in first five to ten seconds. So, make a good impression by concentrating on the first few seconds of the video content. Video apps were on raise. There is an increasing demand for the video apps as advertisers are using the apps for their marketing and the reach. The apps help the people to reach their favorite destination with one click as well as it will take the audience to their favorite content by providing them with different features which can be very helpful for the audience. Even many eCommerce companies had launched the apps to let their consumers shop at one click. But, for the individual app developers, it is challenging to make their app get noticed among the millions of apps in various stores and sources. So, the ìTwitter App cardî is very useful for the app advertisers and marketers. Twitter App card was allowing better quality app installs. The Twitter app card displays the preview of your app to the people. This format helps the advertisers to increase their conversion rates from clicks to install. The app card plays automatically on the timeline which provides better opportunity to reach the audience and helps in attracting the audience towards your application in a simple way. Get connected with the users with your app by providing them their favorable format in downloading the application generally on Twitter platform. More than 80 percent people are watching the videos on the Twitter platform. The advertisers can target with the best tools on the Twitter app card which included with the location, interests, devices, etc. which helps you to ensure the better reach in a right time in a proper way with Twitter app card. Periscope is one of the wells know the live streaming application which enables the broadcasting from the smartphones. Nearly 10 million people were using the periscope application. The app allows to users to login via Twitter account only. These live streaming applications are creating a new trend in advertising, marketing, branding as well as in education system too. With the development of the new technology, people are looking forward towards the e-learning systems which have removed the barriers of education quality. The live streaming application Periscope was very useful for the students who cannot be able to get an education from specific locations. We can see some students who are not able to have particular courses in particular places may lose their opportunities. By using the periscope, it allows the educators to communicate with the students and educate the students with their knowledge. We can also expect further improvement in the educational system via Periscope. Very soon the teaching groups can be formed on Periscope, and live classes were about to air. By using the Periscope, teachers can explain the things as they are. It helps them to have a better teacher and student interaction with the subject. It is also beneficial to reach the students who are absent from the classes. The Periscope is also very helpful to get connected with the classes, and the app is also beneficial to carry on some surveys and seminars on living. The Twitter platform has recently acquired the live streaming application called Periscope. Brands are targeting this application for their marketing purposes. This app allows the marketers with the 24 hrs replay button which paves a new path in video marketing in real time. Many top brands are now using this application in different ways and let us explore some of the best ways to use the periscope app. Periscope is very helpful for the live announcements about the particular offers and contests which helps the brands to get high traffic by small click rates by the live streaming audience. Live streaming makes the better engagement and brands will get excellent opportunity to meet the consumers and more considerable traffic. Companies can crack the better exposure by recruiting best promoters for their names using the periscope application efficiently. Periscope app allows the brands to have a better engagement with the live streaming videos of their brands. The brands are using the app for their creative #streaming of videos that grabs the attention and trying with new star brand ambassadors. This makes the brands to succeed in building fans and consumers towards their brand. Periscope connects the brands and consumers one another with the live streaming in real time. Many companies can use the app for the questionnaire or collect some suggestions and feedback from the consumers to the brands. Periscope will work out with the brands to succeed. Content repurposing is the best way to use the existing content for the purpose by making same changes for better effect. The repurposing means the reusing of the content. So, the content must repurpose in a meaning full way to get good growth on the web. The content can repurpose into various forms from one format to another format. When comes to the repurposing of the video content of periscope then you have to make sure the saved live streamed videos and cycle up the videos in a folder. Here are some ways to repurpose your Periscope video content. Periscope is now, a well known live streaming application which allows the users to air their videos in real time and also able to converse with the people in real time. Now a day the live streams can replay on the web within the 24 hours limit on the Android and iOS applications only. The content can be saved to the servers and can redistribute for an unlimited time. So, there is a chance to repurpose the content here. Edit the video streams and add some clippings to make it more attractive to the audience. It helps the content to look like something new and trendy. It is one of the tactics in repurposing. Use the saved videos and design trailers and demos on them. Add or create some trailers and demos of your live streams that are saved and reuse the same to post the videos. It works in gaining good subscriber rate. Many YouTube channels are promoting their YouTube video on different platforms and now going towards the Twitter to get better results. So, here are some tips to improve your YouTube channel on the Twitter platform. Add the best hashtag on to the Twitter about your video. The Hashtags are the best tools that can promote your video very well across the platforms. Go with proper relevant and trending hashtags to your video and make the audience to get followed by your hashtags towards your YouTube channel. It helps in driving the right traffic to your YouTube channel and also promotes your channel in an efficient way to the audience. Announce to your audience before you are going to host a Twitter chat. Provide them with the information of your Twitter chat time and the day you are connecting. So that, you can carry a great conversation with the audience which can help your channel for better promotion. Post multiple times on the Twitter platform but never do spam the tweets. Many people post the same content repeated times which may lose the interest of the audience towards your posts. So, don’t post the same but post multiple times with different conversations. Twitter Video streaming using Periscope Producer has become one of the best live streaming platform among all social media platforms. This is an extraordinary guide for How to use Twitter for Video Marketing and importance of Periscope on Live Video streaming.